A woman's fan-shaped hoop of coarse linen and cane or whalebone. It has 5 concentric ovals of two strips of cane or whalebone covered with linen, with a curve of cane or whalebone, attached at angle to the top hoop, over each hip. The second hoop from the top is open at the centre back, allowing the wearer to sit down. The lower 4 hoops are held in place with a tape sewn to each side. There is a pair of linen-tape ties on each side on the second hoop down, and a pair of linen-tape ties in the centre of the third hoop down. 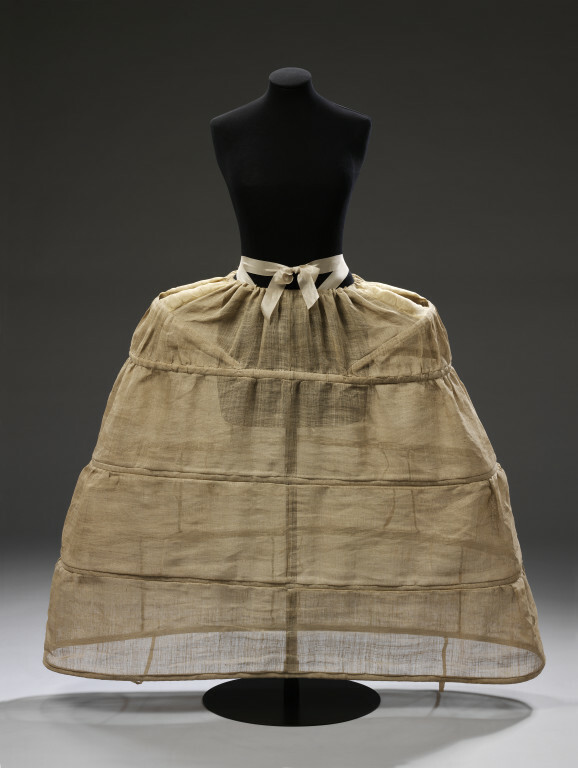 The petticoat is made of coarsely woven linen (10 x 10 threads per cm), with a casing and linen-tape drawstring waist, opening at centre back. Each side of the pocket openings is padded with wool, covered with cream silk taffeta. 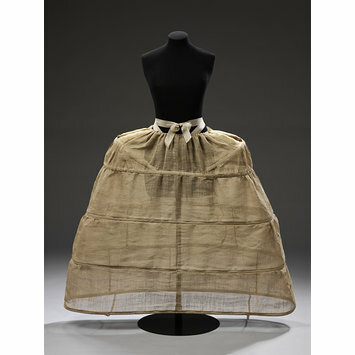 Stiffened petticoats were worn to support the exaggerated skirt shapes fashionable from the 1690s to 1795. Between the 1740s and '70s the very wide skirts of formal gowns had two shapes: one created by the English square hoop, the other by the French fan-shaped hoop. In this French style hoop, the second support from the top is open at the centre back to allow the wearer to sit down.